Today was the last day of preschool before the holiday and they had a lil’ performance for us. I am annoyed that the school isn’t open until Wednesday, like the big kids’ school, but the show was so cute, I almost forgive them. I will have to be up early to make sure Hummus is the first one at childcare at the gym tomorrow! Hummus’s part in the play was one off the savages. He was wonderful in the part! 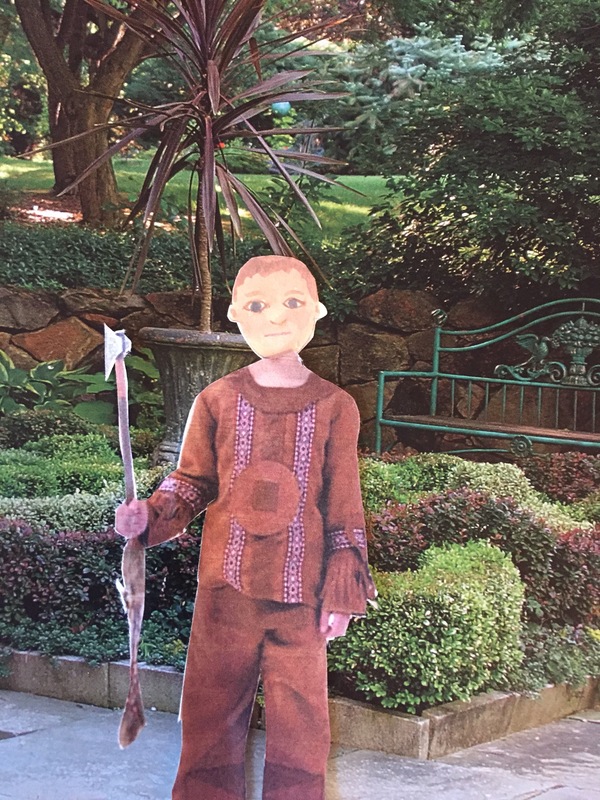 He looked adorable and the spear he carried was very sharp. The older boys made them and helped the younger ones to spear squirrels with them last week. I love hands on learning even if the blood was a little upsetting to Hummus. Each child colored their own program for their parents. I think Hummus shows a lot of growth in coloring this year! Some of the other moms were showing off with their perfectly colored programs, but if you have 11 kids odds are one of them will be a coloring prodigy. Honestly. He looked like he was exhausted afterward, so I dropped him with the cleaning ladies I hired to spruce things up a bit before Thursday and ran off to do some pre-Black Friday browsing at the jewelry store. i wonder what Cari and Röb found for me? The cleaning crew seemed upset when I got home but it was hard to understand what they were going on about. Honestly, Thanksgiving is such a lot of work! I think I have a my grain. 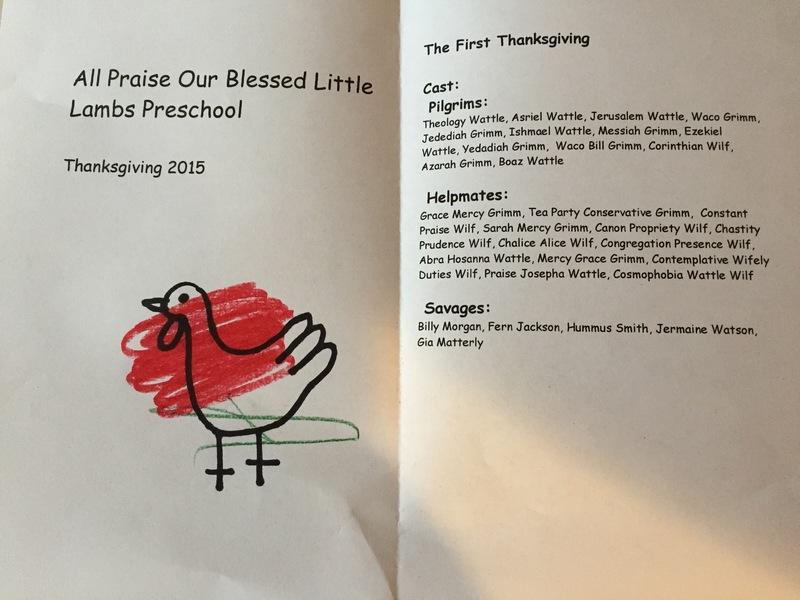 This entry was posted in Holiday fun and tagged All Praise Our Blessed Little Lambs Preschool, coloring, Hummus, play, Thanksgiving on November 23, 2015 by mythreeangles. Contemplative Wifely Duties & Tea Party Conservative? Such cute names! It does look like the school might be a lil’ prejudice relegating the non-Grims & non-Wilfs to “savage” roles. Did you get that adorable lil’ Hummus potty trained yet, Lah Lee? Maybe a real school for him next year? He’ll never get into one of the Ivies with those classmates. Lol! Are you sure that Cari and Robert are planning to buy you a present? It has to be something else. I bet it’s a trip- travel planning is so complicated and that would explain all their many meetings. Maybe it will be someplace exotic- but not so exotic that you have to get shots before you go. Adorbs! Human is looking so tall and handsome! I bet you could pick out a couple of wives for him from the preschool crop. Polygamy and arranged marriages are so beneficial for the man. It’s really sweet how many chores multiple women can do.